Item # 260944 Stash Points: 695 (?) This is the number of points you get in The Zumiez Stash for purchasing this item. Stash points are redeemable for exclusive rewards only available to Zumiez Stash members. To redeem your points check out the rewards catalog on thestash.zumiez.com. Mix up your bracelet collection with this Stone + Locket bracelet multipack. The silver braided bracelet will pop from the back chord bracelets featuring different pendants. The galaxy pendant alone will make you fall in love with this 4 pack. 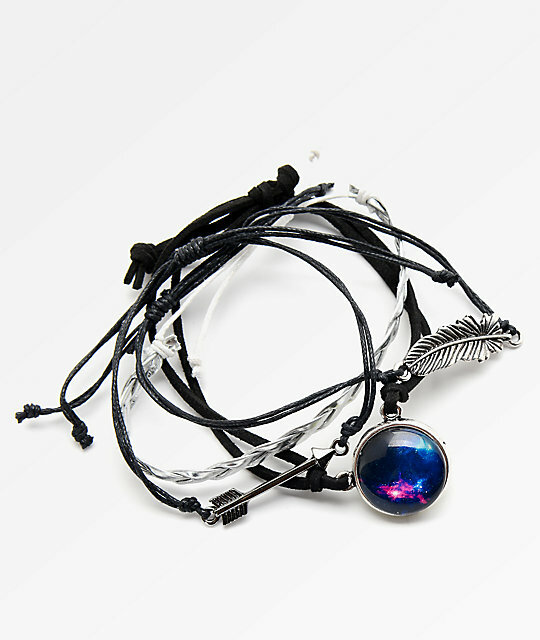 Braid, galaxy and arrow bracelet pack by Stone + Locket. Each bracelet has a different pendant; one with an arrow, one with galaxy, one with an arrow. Chord bracelets feature adjustable sizing piece for a custom fit.